New York - The Waterford crystal ball in Times Square is being worked on in preparation for its glittering entrance into 2016 later this week. Workers are installing 288 new sparkling Waterford crystal triangles. They are being added to more than 2,100 other crystal triangles to create what’s being described as a “Gift of Wonder” design. The ball is being worked on atop One Times Square at 42nd Street and Broadway. The custom-designed crystals created by Waterford artisans are built to withstand high winds, precipitation and temperature fluctuations. 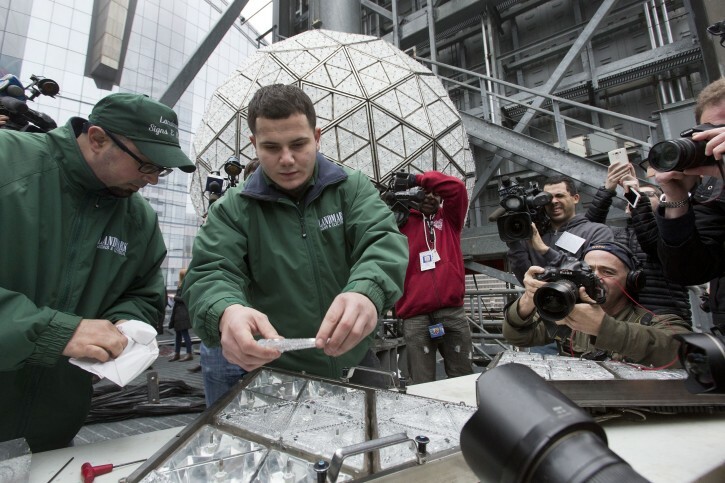 The ball, a New Year’s Eve icon, must be sturdy because it will rest 470 feet above Times Square. Hundreds of thousands of people in Times Square are expected to watch the ball drop at midnight Thursday. Anu ameilim, v'heim ameilim. Anu ratzim, v'heim ratzim. And your life is affected how? live and let live - lots can be said of many but you keep the negativity to yourself - what good does it do anyone? Why even mention this non event? It is total Shtuss V'Hevel.